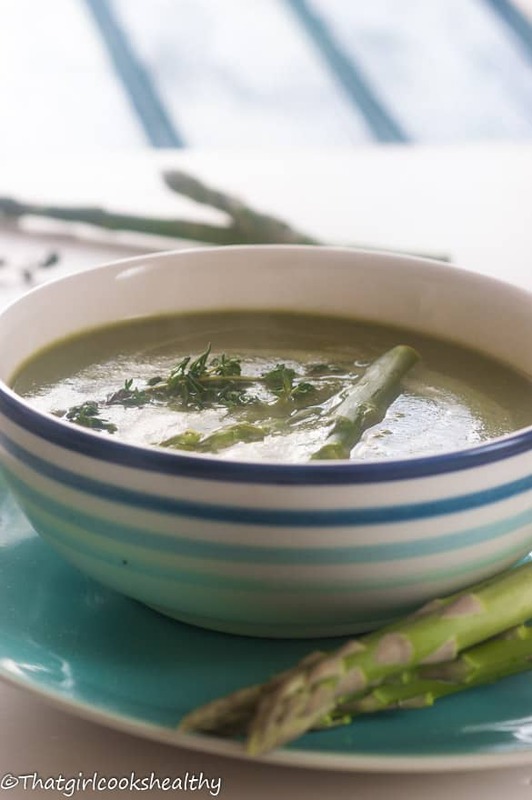 Vegan cream of asparagus soup – this dairy free cream of asparagus soup is prepared with fresh asparagus spears, coconut milk, vegetable and seasoning. 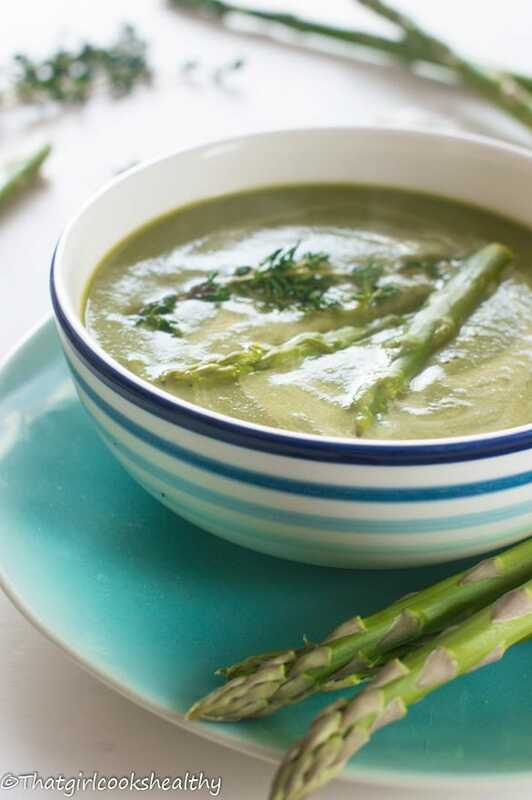 With winter still being in full effect, it’s time to pull out a few soup recipes including this vegan cream of asparagus soup. If you have been following my blog for a number of years, then you would know that during the cold snap, I love nothing more than to cosy up to a bowl of hot soup. On the blog you will find a selection of soups to test out for yourself. My favourite has to be roasted red pepper and tomato soup and for that Caribbean touch, nothing beats some Jamaican gungo peas soup . While the aforementioned soup might be adored by me, there’s always room for one more. 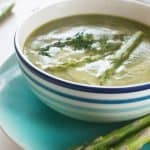 Last month while I was browsing through a few cookbooks for some new ideas, I came across this vegan cream of asparagus soup. Perhaps I’m the most boring person on the planet because when it comes to asparagus I usually prepare them using the same old cooking method so prepping them for a soup dish was a new adventure for me. Although my recipe is vegan friendly you don’t have to lead a plant based lifestyle in order to embrace this dish. It’s so simple to pull together and incredibly tasty low fat comfort food. The most important step for this recipe is to use the asparagus spears (heads) only and discard the woody ends as they will distort the taste. You may notice that this soup has a rather deep green hue to it and that is because of the additional handful (or two) of spinach. Spinach is a vitamin enriched superfood that’s loaded with vitamin b and k – both are essential for the healthy red blood cell formulation. Not only does this soup has an aesthetic edge to it BUT……the health properties are well worth giving it a try. On low heat, melt the dairy free butter in a medium sized saucepan. Saute the garlic and onions until translucent and then proceed to add the asparagus spears and spinach – allow the spears and spinach to soften for 5 minutes, stirring occasionally. Pour in the vegetable stock and coconut milk then bring to the boil. Season with pepper and fresh thyme before reducing the heat to simmer for 10 minutes. Transfer the soup contents into a blender and puree into a extra smooth texture. This sounds and looks heavenly! I would definitely try it as I’m constantly on the look out for new ways to consume asparagus. Thanks! I too am guilty of preparing asparagus in only a few different ways. I don’t think I have made asparagus soup before. Love that color! Asparagus is so good for you, this dish looks fresh and tasty. This is one of my favourite soups. I usually add a bit of oat cream to it too, as I love creamy asparagus soup. This sounds so comforting and delicious I love that it’s healthy too! I’d never thought to use asparagus in a soup, either! This sounds delicious – I’ll have to try it as asparagus comes into season here. Lovely. This is my absolute favorite soup recipe! I am getting ready to make it again right now. So good!